Ornamental Sea Kale, or Crambe is a hardy perennial plant, member of the Mustard family, Cruciferae. 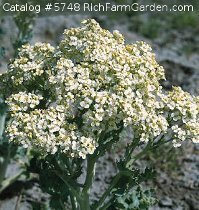 Related to the Brassicas, the plant gives off the odor of cabbage when crushed. 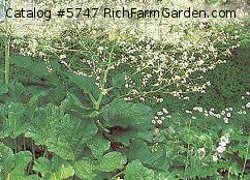 The plants have large ornamental leaves and spikes with pannicles of airy, delicate summer blooms. The plants are used both as ornamentals and as food. The leaves and roots of the plants are eaten - young leaves as greens and the roots are boiled. All parts of the plants have a mild cabbage flavor. The roots are also used to treat itching.